Knowing that I had a lot of Christmas recipes to make over the next couple of weeks I made a trip to Walmart to stock up my pantry. Baker’s Baking Chocolate, Jet-Puffed Marshmallows, Planters Peanut Butter, chocolate bits, sweetened condensed milk, flour, sugar – pretty much the baking aisle. I usually make more than I plan to, and I don’t like needing to run out to pick up extra ingredients if I can help it. Spray an 8x8 pan with cooking spray (or use butter to grease); set aside. Place butterscotch bits, chocolate bits, and peanut butter in the top of a double-boiler (you can also use a large, microwave-safe bowl). Melt the ingredients, stirring frequently, until completely smooth. 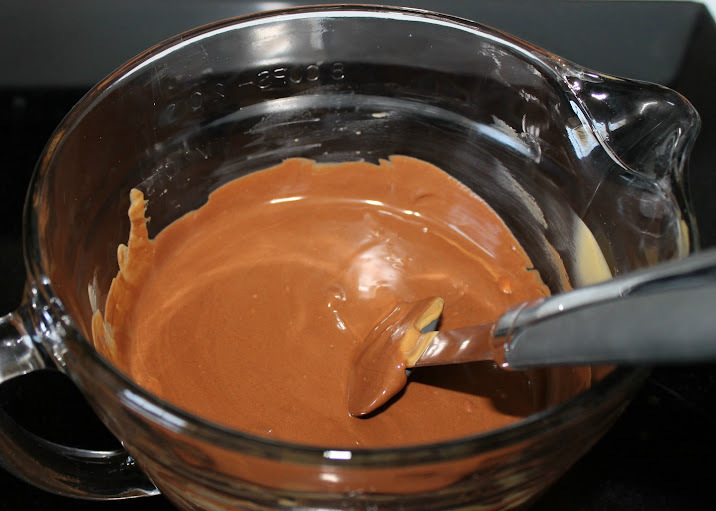 Fold in marshmallows and peanut; stir gently until everything is coated. Pour mixture into prepared pan and refrigerate until set. If you’re giving the entire pan of squares away as a gift, I like to cool them in disposable pans in holiday colors or themes. If you’re splitting the batch up for different recipients, you can pour them into a regular 8×8 pan and then cut them once completely set. Wrap them in plastic wrap and return to the refrigerator until you’re ready to deliver or eat. I’m going to pair these Rocky Road Squares with a few other easy dessert recipes. For example, I made some of my favorite Pomegranate Chocolate Bark to give out. Baker’s Baking Chocolate in Semi-Sweet and White make these a breeze to put together. They take less than 10 minutes to make, and that counts melting time! As these will be going to my husband’s uncle and his family, I wanted to make a main dish for them to share, too. 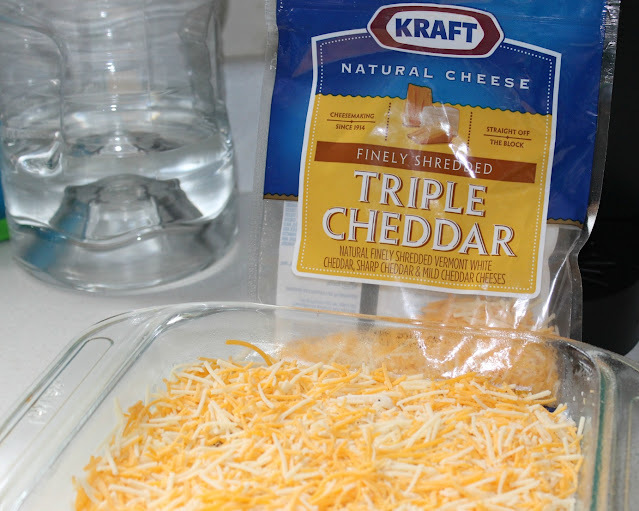 I had stocked up on plenty of Kraft Shredded Cheeses, so I decided to send them one of my Sausage Breakfast Casseroles. They’ll be able to enjoy it for either dinner or brunch. For more Christmas recipes and other ideas be sure to check out the Holiday Family Table with Kraft magazine below. I’m sure you’ll find lots of yummy things to make! What are your favorite easy dessert recipes? this looks so good, and easy to make. Anything chocolate is a good thing! Oh yum! These look so easy to make, and you can make a bunch at one time — my kind of recipe. I love food gifts! They’re perfect for people who have it all or who simply don’t want more stuff. Tasty looking recipe! 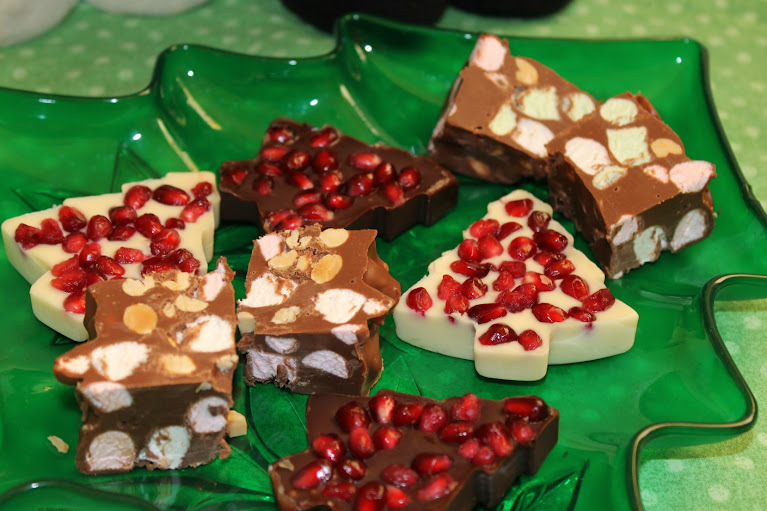 These rocky road squares look delicious! What a perfect easy holiday gift! I was blinded by the rocky road and could not se anything else! That is also one of my favorite ice creams! thanks for this food pics! the pomegranate bark looks AMAZING!! Mmm – being a fan of Rocky Road ice cream, and I sure I would love these squares. My mouth is literally drooling right now just looking at all the chocolate in that photo! I jut finished dinner now I a, hungry all over again. What a thoughtful gift to give. You are giving me ideas for next year! I never would have thought to put pomegranate with chocolate. I have three sitting in my fridge. I’m going to have to give that a try! All three of your recipes look so delicious! 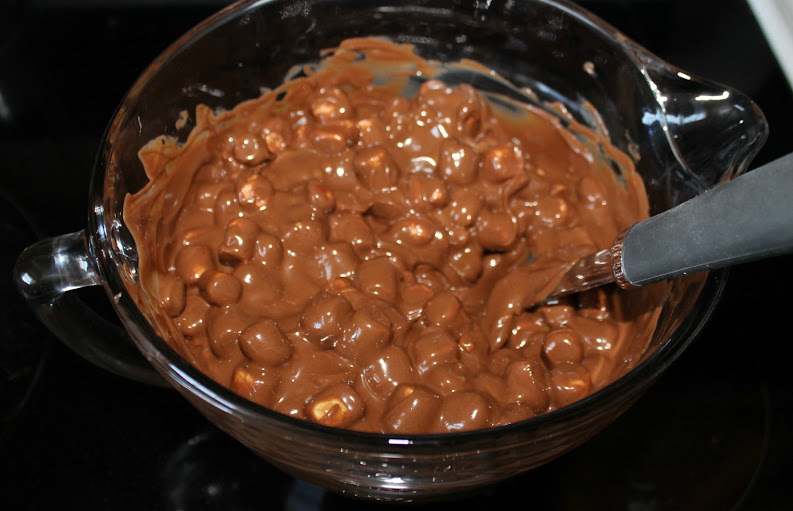 I have never made a rocky road candy like yours so I am going to pick up the ingredients tomorrow and try it out! I love your Pomegranate idea as well, I was recently wondering what to do with pomegranate since it’s in stores at a reasonable price right now — I’ll pin this post for later! Darn, now I’m hungry again! I want those squares! I like my easy toffee recipe. It’s just a heat pour and cool! You now have me hungry. 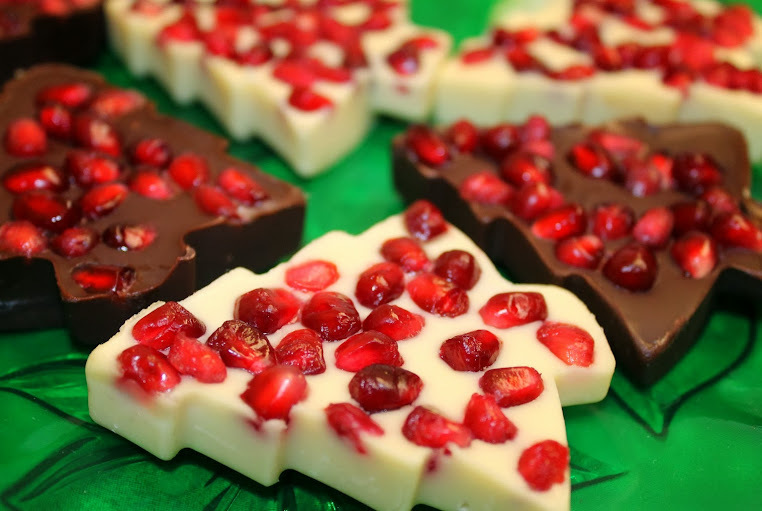 I want to try that Pomegranate Chocolate Bark ! I love the Christmas tree shapes, so cute and festive! These sound great! Ah, this all looks so good! I love Rocky Road, this is definitely going to be on my list to make next week. Food gifts are great to give at the holidays! They almost always get eaten, where another Christmas themed dish towel may sit in a closet forever. Your Rocky Road squares look amazing! I may have to try making them this year. 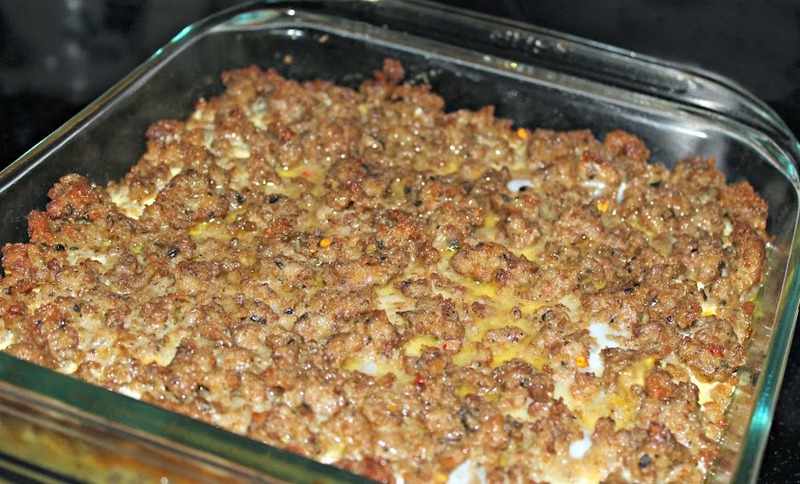 It’s a super gray, rainy day here, which I think is the perfect time for breakfast casserole brunch then snuggling on the couch to watch Christmas specials! 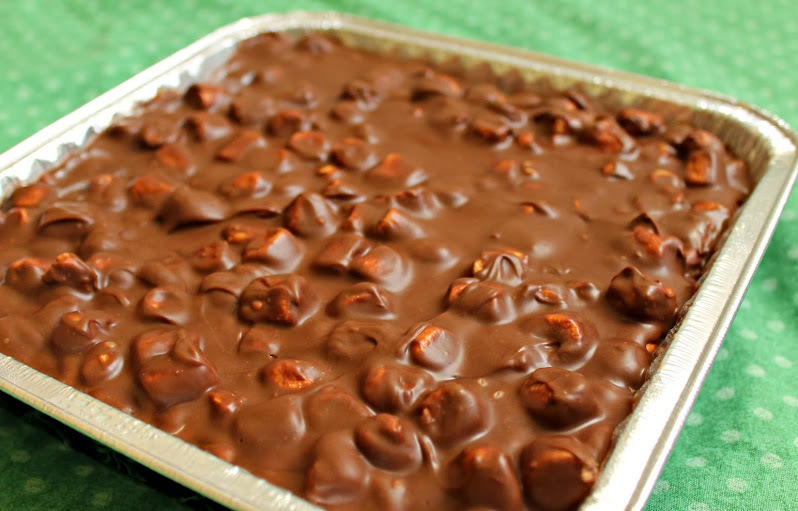 These rocky road squares look delicious and EASY to make as goodies for Christmas Gifts for our neighbors and friends. I’m already planning next year’s goodies!! Anytime you mix chocolate and marshmallow it’s a win!